My name's April and I've been inolved with Outside In for roughly 5 years. I was first invited to meet the group by a friend of mine who is also still involved with the group. I started to come along more regularly and attended various training sessions that enabled me to become more involved in teaching and interacting with the students. Being part of Outside In has helped me put my experiences across to the students and members of staff. Outside In is about participation, being involved, being able share your experience with students in a way that gives the reality factor to eduction. Although the academic side is so important, the real side of practice needs to be taught also, and this is where people who use the services students will work for in the future play a vital part in education. 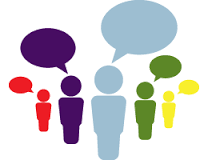 The students get an opportunity to learn and practise skills such as communication. It is a taster of what they will experience when they go out on placement and when they've completed their degree. Students find our input informative and enlightening; they have also said it's great being involved with Outside In as it gives them an idea of what to expect. Being involved with in the social work programme has given me wonderful opotunities to beome involved with other aspects of university life such as nursing where I have taken part in recruiting students to the Nursing and OT degrees, and talking to the students about my experiences of the NHS. "I got involved with Outside In via the Expert Patient Programme, through my GP surgery. I have a Neurological condition called syringomyelia. To find out more please visit the Ann Conroy Trust homepage here. I studied and trained to be a physiotherapist at university, but now instead of providing these services i recieve physiotherapy myself. I have been a member of Outside In for about 8 years. Being involved gives me a sense of worth. I'm unemployed so I don't get the normal everyday interactions that i used to. Coming to the university is good because it gives me contact with the real world. It is also rewarding to know i am helping students to develop their skills and to know that my input is fully appreciated. 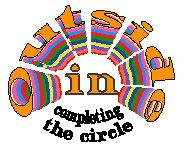 I got involved with outside In about 10 or 12 years ago when Lester Parrot was leader, first introduced by Sandra Williams. "What can i bring to the group"
at this time we did not have a group name. Over the years i have taken on board things that I have picked up from the group. I have taken this back to the community and put back into outside in from the community. This group, you could say is a two way street that I hope has bought views of both sections to light. Our group has worked up to a point and I hope I made the difference. "MR Doleman, I am very sorry to have to tell you, you have parkinsons." So stated a specialist. I by contrast breathed a sigh of relief that the cause of my depression and worse, was nailed. Whatever parkinsons threw at me was going to be a battle with a known enemy. When I heard about "Outside In" I felt it would provide a channel to assist others and would lead me to do something in my retirement.